If you don't know this about me, you should: I'm a word nerd. I love interesting words and enjoy incorporating them into my everyday vernacular. This past week, I used one I haven't used in a while: ARREARS. It means being in a state of being behind or late, especially in the fulfillment of a duty, promise, or obligation. Basically it's an unpaid and overdue debt. I had occasion to use this word when I made a phone call to Starbucks' partner resources department. I thought I was in arrears for the deductible portion of the health insurance I carry for my family. I've cut back my hours since June and I was concerned my debt was going to come due and I wanted to be prepared. As my husband and I get on a plane today to head to snowy Chicago for Thanksgiving, I feel as though I'm in arrears in another category: eucharisteo. This Greek word means seeing something as grace and giving thanks for it. It's hard to do that right now. When I checked my Google news feed today, the top five stories all involved death. Not just people dying, but individuals being murdered. It feels like mayhem is beginning to abound, like darkness was loosed after the trifecta of terror last Friday. Now pain and sorrow seem to be everywhere I turn. This afternoon when I texted a friend who's on the road to visit family, she shared her heart and what's grieving the hearts of friends she knows. I learned about a granddaughter whose heartbeat can't be heard in her mama's womb any more, and a college-aged niece who died in her sleep. More seemingly unnecessary grief. That's when I realized where I needed to turn. The Word. 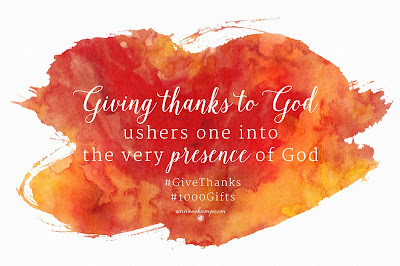 I had to remind myself that God wants to hear my words--not only my grief and anxiety and frustration and disbelief--but especially what I'm thankful for. He doesn't deny this is going to be hard. When I sacrifice my inclination to wring my hands, embrace anxiety, or pull my hair out in frustration and offer thanks instead, I put myself in a position to let God show me how He will save what looks lost beyond repair. And that's the reality. This world was lost beyond repair the minute Adam and Eve bit that apple. The entire human race is in arrears with God. How do we repay that kind of debt? That's why God is the only One Who saves. He's the only One Who can clear our account so that we're not in arrears with the God Who made us. So He did that when He, God, inhabited flesh. Emmanuel means God with us. I think I can begin being thankful for that. Thank You, God, that You have not left us alone in this world. Even though I do not understand the depravity that exists within us that would allow us to be deceived to the point of immense evil and untold cruelty and inexplicable grief, and even though I do not understand why You do not intervene to keep such tragedies from invading our lives, I can see it as grace that You didn't leave us to our deviant devices and thank You for coming to save us from ourselves. What is your hard eucharisteo today? My peaceful day was shattered when I heard about the Paris attacks, but I felt nothing. I was detached and unmoved, and that realization unnerved me. 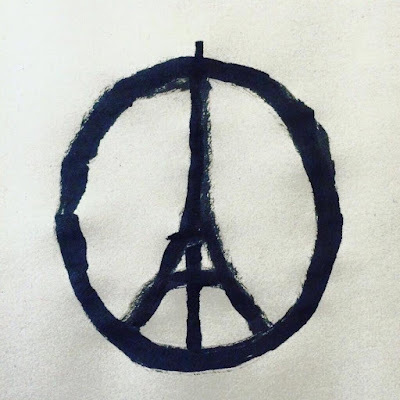 As I scrolled through Facebook Saturday and saw profile picture after profile picture striped in the French flag and a redrawn peace symbol with the Eiffel Tower as its centerpiece, I still felt numb. I texted my son Michael. I wanted someone else's take on this. I told him that I felt nothing about this latest atrocity--a word I realized I was unacquainted with and unaccustomed to hearing until 9/11--and that this disturbed me. His response? It's become common to be numb to violence. When I heard the media "reporting" that the refugees were to blame for the attacks, I felt my hackles rise. I couldn't believe that these people could conspire to harm the very people providing them shelter. Soon, ISIS would take responsibility, and the media is now reporting that evidence had been found that one of the terrorists infiltrated France by masquerading as a refugee. But I still felt more emotion over the implications this has for the refugees than I did for the victims. I still can't understand why. Perhaps I'm worked up about the fact that a group of people already in peril are becoming embroiled in an incident they didn't create. I can't do anything to bring back the dead but I'd like to do something to influence the refugees' future. Michael and I talked about how easy it is to vilify people we do not know personally. I don't know any Muslims--do you? Without any frame of reference, it's easy to be duped into believing what is said about them because I don't have a name and a face and a relationship through which to filter the blanket statements. One author I read stated that the refugees are "indifferent" to the deaths in Paris because the victims represent societies and systems of government that they don't agree with. He was implying that just because they're Muslims, they agreed with the actions of ISIS. It almost made sense. I was almost deceived. Not all Muslims are terrorists but all terrorists are Muslims. Is that a true statement? Some are acting as if this one is: All refugees are Muslims and all Muslims are dangerous. The actions of some radical Muslims are turning once open-hearted people against the refugees as if they too are radicals. How deeply do I believe that these refugees are people first, not the embodiment of a stereotype? Would I be willing to welcome a refugee family into my home? Even if I wanted to, Georgia's governor has issued an executive order directing state agencies to prevent the resettlement of Syrian refugees. I think it all boils down to whether or not I believe that Light conquers darkness. Always. Ultimately. Eternally. And I do have some feelings about that. The question remains: what am I going to do with them? I’ve been keeping my own company much of the past few weeks. Bob worked out of state for eight days and while he was gone, Dakota and I established our own routine. The days start later and end earlier now. I’m secretly glad because the time change creates morning opportunities like today. One of the secret joys of working the opening shift at Starbucks is that I get to see the night sky, particularly the constellations and some planets. The mornings I don’t work, I’m almost sad to miss the show. This morning, however, Dakota noted my first stirrings, her nudge of my outstretched hand a request. I dressed as she stood by the laundry room door where we keep her leash. Orion had almost finished his march across the navy expanse, and the Big Dipper was emptying its contents on the dark houses we passed. As we strolled the way we always go, the clouds in the sky began to take on a dusty pink cast, hinting at the not-yet-risen sun. I craned my neck, trying to take it all in. It’s hard to walk like this without falling. A lone planet blazed on the eastern horizon--solitary, unmoving, unblinking. All too quickly light overcame the darkness and the stars faded to invisible. The quiet was broken by cars beginning their commutes down our road, a winding asphalt ribbon without stoplights to the highway. The last memory of dawn presented itself as a soft yellow light across the blue table as I prepared breakfast. A glorious telling of the heavens welcomed a quiet day. Twelve hours later, as I waited for Bob to come home from work, Dakota nudged me again to venture outside. Like the morning stargazing walk, we make a twilight trip. I never want to go but I’m always glad I did. Tonight the breeze was crisp but not biting. The horizon glowed like the embers of a dying fire and the most elegant sliver of a rising moon rose in what was left of the faded blue jean firmament. Again my eyes were trained on the horizon as silhouetted trees arranged themselves on an orange and amber backdrop. I cannot take in enough of this scene and no camera could ever do it justice. A perfect bookend to the day. Or so it seemed. Soon after we got home, I heard the news about Paris. In just a few short weeks, we’ll be sitting in the car for 13 hours--just like many of you, I suppose--in order to sit with family at tables in Wisconsin and Illinois to give thanks. But already I’m teetering between excitement and anxiety. Why does the holiday designed to feed thankfulness seem to leave me starving for peace? We make it “home” once or twice a year. Yes, in between those times we Georgians talk on the phone and email and text with the northerners, but that just doesn’t substitute for face time and “breathing the same air,” to quote a dear friend. Because I'm a planner, I begin to anticipate the time long before it’s on anyone else’s radar: reservations need to be made, schedules coordinated. And, consequently, happy hope quarrels with disquieting self-talk as I play out possible anticipated scenarios of time together in my head. The difficulty with anticipation is that it can morph into expectation when you’re not looking. When families don’t see each other often, there’s an unsaid but very real desire for everything to be GOOD. I so want to find everyone doing well. I hope for meaningful conversations because I want to come away from the time knowing more about those I love. That puts a lot of pressure on the limited hours. But I know the truth. No one’s life is all well and good! Everyone struggles on some level. So let me tell you what GOOD looks like to me: cutting the crap and just telling it like it is. If we could, I believe we’d discover a sympathetic ear or a shoulder to lean on, and a moment of shared strength to help us know we’re not as far apart as the distance makes us think we are. Yet who wants to go first? No one. So the opportunity is lost, the time hasn’t lived up to what I’ve anticipated or expected, and I’m faced with how to deal with what is. This year I’m going to try to anticipate Thanksgiving realistically. I want to embrace the anticipation, reject the anxiety, and release myself of the burden that any of it is my problem to solve. I want to wait for the moment and, in that moment, risk being authentic, even if it’s awkward. I want to experience the day--the good, the bad, and the possible ugly--because in everything there is something to be thankful for. I’m willing to go first. What do you want your Thanksgiving to be this year? One of my fondest memories from my teenage years is eating liver and onions at my grandma’s house. 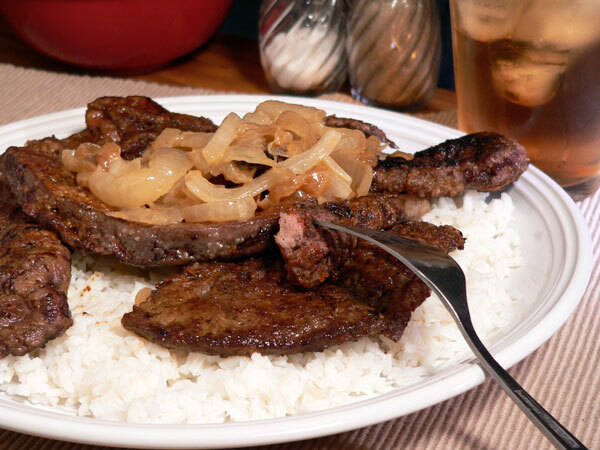 Yes, liver and onions! My grandma lived by herself near our house, and every now and then she would get a hankering for the dish but didn’t want to eat another meal alone. So, she’d call and invite us over for dinner. Initially my sister and I didn’t like liver and onions, and grandma knew that. So, she would serve homemade macaroni and cheese with buttered toasted bread crumbs on top as a side dish to the liver and onions. We could have just the macaroni or we could have it with the liver. The reason she never made us eat the liver was because having our company for the meal was more important than seeing us choke down something we didn’t like just to appease her. Instead of making an issue between us about the liver and onions, she wouldn’t really even mention it.